As someone who grew up in the midwest, and who lives in Arizona now, I'm fascinated by the different attitudes there towards work and leisure. In Minneapolis, I call it the "midwestern work ethic" and in California and Arizona I call it "being laid back". Whether these attitudes are good or bad depends on what you value. Growing up in Minneapolis, I was taught to value the kind of hard work that made me deliver newspapers in the snow. I was taught at an early age to save money, to value this type of accomplishment. I did well in school, I got good grades, and at the age of 18 was fully immersed in this way of thinking. And then I moved to Arizona, and my transition began to becoming kinder, gentler, and more patient. I met people for whom writing down little marks in a ledger wasn't the whole meaning of life. I met people who valued time with family, with friends. Yes, I'm still anxious, and "twitchy" but I've seen what life can be like away from the "midwestern work ethic". Now don't get me wrong here. If you have that strong drive to "do it now" and know how escrow works, I'm happy for you. I still have so much of my old midwestern work ethic left in me now that I can manage myself, and my finances, quite nicely. I always wear a watch, I can tell you what day it is, I know what I'll be doing next week. I consider that part of being a responsible adult. And then I moved to Santa Barbara, California, and I really got a chance to see what "laid back" means. If you've lived there, you know. There's just about no sense of time at all there. Whether it's spring or fall, or morning or afternoon, it's all the same. I often say that I "wasted three years of my life" there, but what I saw began my transformation. I started becoming a Californian, and it worried my friends back east. For the first time in my life I just sat on the beach and watched ocean waves. At first I would carry a sketch book (because you're always supposed to be accomplishing something, you know) and then I would just go there. I would borrow a neighbor's dog and walk. To this day I struggle with making a balance between my "midwestern work ethic" and taking the time to enjoy this beautiful world. And I'd like to believe that the balance for me has tipped. I have lost my interest in the types of work-work-work accomplishments that some people value, and I've seen things that I know that they won't see, or even look at. No one who knows me would describe me mostly as kind, gentle, and patient, but when people do, I'm flattered. 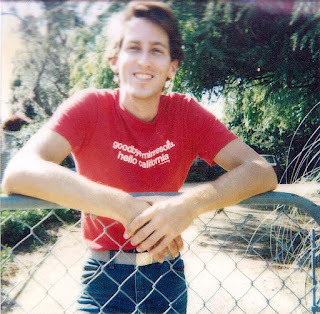 Image at the top of this post: Me in Santa Barbara in 1983. 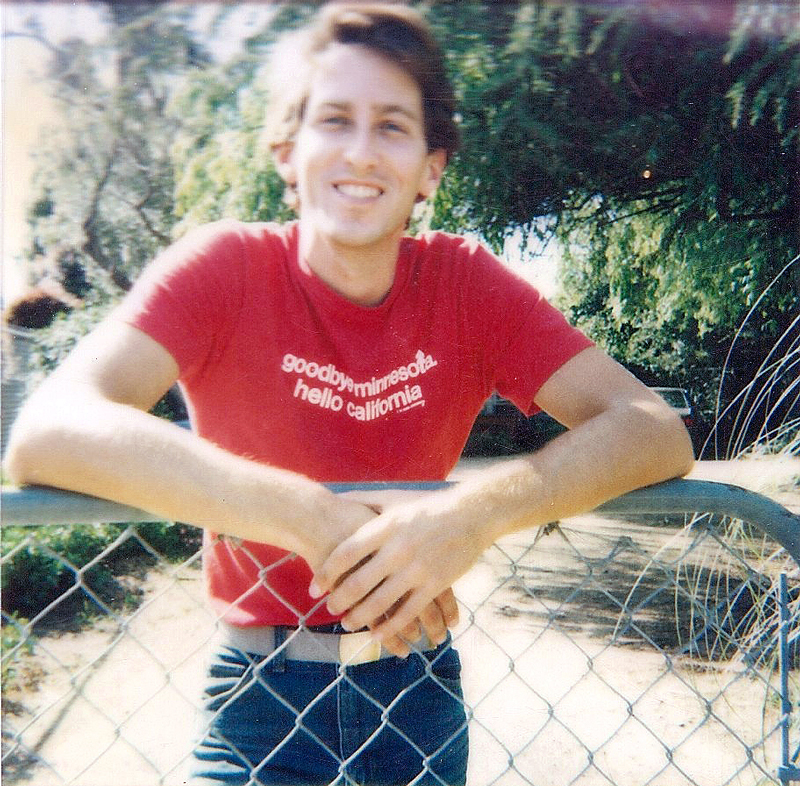 The tee shirt says "Goodbye Minnesota, hello California." This was a young man who was learning to "chill out".